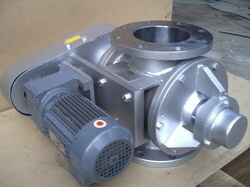 Pioneers in the industry, we offer rotary valve from India. We offer technically advanced & maintenance free Rotary Air Valves for the buyers. It is widely used for low to medium Differential Air Pressure Systems and Volumetric Feeder Discharge Equipment. Our range of rotary air valves are at par with the set industrial standards and measured up to the specific requirement of the clients. Rotary airlock valve is mechanical device used for continuous discharging bulk powders or granule material under gravity flow. A multi-vane rotor revolving in close contact in the housing .Inlet is at the top of housing and a outlet at the bottom in drop through type such that material enters from the top and discharges horizontally at 90 deg.